Russia had begun developing a major warship construction centre at St Petersburg in 1704, and by the 1880s it was capable of building its own battleships. Indeed, St Petersburg had three naval yards for battleship construction: the New Admiralty yard, the Baltic Shipbuilding and Engineering Works, and the Franco-Russian Works at Galerniy Island. Although Russia’s military-industrial base was still relatively small, it had the resources to produce most of the materials it needed for warship construction. Naval guns were built by the Obukhovskii Works (OSZ) and Putilov plants, armour was made by the Izhorskii Works and engine machinery by the Baltic Works. However, the fragile Russian industrial base could not handle surges in naval orders and often had to purchase quantities of armour plate, weapons and machinery from Britain, France, Germany and the United States. Warship designs were selected by the Morskoi tekhnicheskii komitet or MTK (Naval Technical Committee), but influential admirals in the Naval Ministry could and did tinker with the designs. 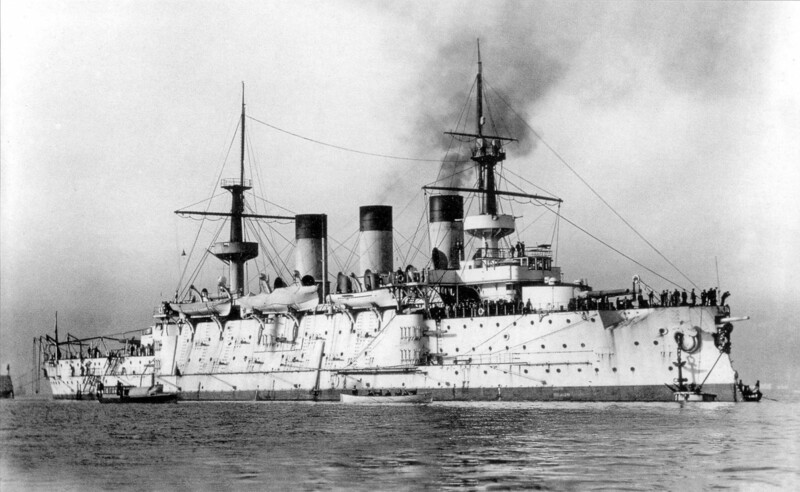 Russia began building its own ironclads in the 1860s and by 1876 it completed its first battleship, the Petr Velikii. It took the Russians over seven years to build the Petr Velikii and it was an expensive and frustrating experience. The Russian Navy did not order another battleship for another thirteen years, until the accession of Tsar Aleksandr III in 1881 brought sweeping changes to the Naval Ministry. In April 1882, Aleksandr III approved the Twenty Year Program, which authorized the building of up to· 24 battleships by 1902. The MT.K was tasked to design these new battleships in a period of rapid technological change and it often tried to hedge its bets by simultaneously pursuing different technical directions. In 1885, uncertain as to whether turrets or barbettes were better, the MTK took the simple expedient of building one of the new Imperator Aleksandr II-class battleships with 12-in/30-cal guns in turrets and the other with barbettes. In November 1890, the Naval Ministry ordered the MTK to develop two different design paths, one for a first-class battleship based on an improved Imperator Aleksandr II-class and another for a second-class battleship. While the MTK was designing battleships, it was also making efforts to improve the firepower of its ships. In the early 1890s, Vice-Adm Stepan O. Makarov, chief inspector of naval artillery, proposed, a major upgrade for Russian battleship armament. Makarov advocated developing a new 12-in gun that fired lighter shells with higher muzzle velocities in order to hit targets beyond traditional combat ranges. In conjunction with Canet, Obukhov designed the 12-in/40-cal M1895 to be the new primary weapon for Russian battleships. The new gun extended the engagement range of Russian battleships from 5-6km to over 10km and increased muzzle velocity by 25-35 percent over previous models, as well as reducing reload time from 2-4 minutes to only 90 seconds. However, the bursting charges were substantially reduced in order to save weight on the shell, resulting in less “punch” when it hit its target. Makarov also advocated armour piercing capped (APC) shells, which should have given Russian battleships a decisive edge, but due to cost few of these improved shells were purchased. Further, Makarov directed a junior officer, Semyon V Panpushko, to perfect the explosive Melinite for use in shells. Panpushko discovered something that had eluded the Japanese – that acids within Melinite reacted with the steel in a shell casing and formed dangerous compounds – but he was blown to bits in November 1891. After Panpushko’s death, the Russian Navy lost interest in Melinite and decided to retain gun cotton until a safer alternative could be found. The design for the second-class battleship was completed in August 1891 and the New Admiralty yard began constructing a 10,000-ton battleship, the Sissoi Veliki, which incorporated all the latest innovations including four 12-in/40-cal guns in two barbettes, Harvey nickel-steel armour, Belleville boilers and high freeboard. Typical of the ever-changing Russian process of ship design, two years into construction the MTK ordered the Sissoi Veliki to be completed with turrets instead and changed both the types of 12-in and 6-in guns. Invariably, Russian battleships ended up overweight and over-budget. Once completed, the Sissoi Veliki was 1,500 tons heavier than expected, increasing the draught by 3 1/2 feet – which caused her main armour belt to lie 4ins below the waterline. Thus the Sissoi Veliki’s formidable 16-in-thick Harvey nickel-steel main armour belt was submerged underwater, leaving only the 5-in-thick upper belt for protection above the waterline. While the Sissoi Veliki was considered “second-rate,” it did validate key design features and set the pattern for the Russian battle fleet that was evolving on the drawing boards in St Petersburg. Six months after work began on the Sissoi Veliki, the New Admiralty and Galerniy Island yards began work on the first-class battleships Poltava, Petropavlovsk and Sevastopol. The Naval Ministry requirement called for a 10,500-ton battleship with emphasis on armoured protection, seaworthiness and a range of 11,000km. The MTK based some of the design on the American Indiana-class battleships with a flush-deck hull and high freeboard, but also partly on the French battleship Brennus. The Petropavlovsk-class was also noteworthy for adopting French-style turrets for its 6-in secondary battery, but was somewhat regressive in using standard cylindrical boilers rather than the new Belleville boilers. The class was severely delayed by the inability of Russian industry to supply the 12-in/40-cal Pattern 1895 guns and armour plate on schedule, resulting in construction lasting seven years. Once completed, the Petropavlovsk-class battleships were fairly seaworthy and capable of 15-16 knots, although their new 12-in guns suffered from defects that impaired their firepower. The Poltava was the first Russian battleship to use Krupp armour from Germany, while the other two ships in the class used Harvey nickel-steel armour purchased from the United States. In most respects, the Petropavlovsk-class was a fairly successful design for its day and all three ships were duly sent to Port Arthur. Despite their development of a fairly effective battleship design, the Naval Ministry decided to experiment with other variations of armament and armour on the next class of Russian battleships built for Far East service. Britain had commissioned two fast battleships of the Centurion-class in 1894, armed with 10-in guns. When the MTK began designing the next generation of Russian battleships in 1895, England was considered the likely enemy and the resulting Peresvyet-class was conceived as a fast “battleship-cruiser” that could act in anti-cruiser or commerce-raiding roles. The Peresvyet-class used the lighter 10-in/45-cal Pattern 1891 gun, which enabled the ships to carry 29 percent more main gun ammunition, but the rate of fire was disappointing. Work began on Peresvyet and Oslyabya in November 1895, and Pobieda in February 1899. In trials, all three ships demonstrated the ability to attain speeds of 18 knots with their Belleville boilers, which satisfied the requirement for a fast battleship. However, all three ships were grossly overweight, causing the armour belts to be submerged below the waterline when fully loaded. The Peresvyet-class were typical of the type of compromises that seem reasonable in a time of rapid technological transition but do not ultimately perform on the battlefield – the ships of this class were relatively fast and suited for anti-cruiser duties but lacked the firepower and protection to go toe-to-toe with a first-class battleship. This entry was posted in Russia, Warship by MSW. Bookmark the permalink.